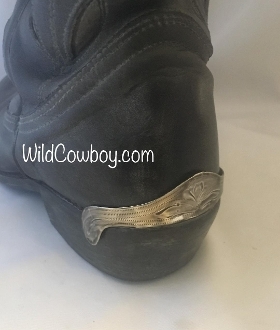 Medium- Laser Etched Antique Silver Cowboy Boot Heel Guards. Each one is hand wiped with an antique finish over the sterling silver. Length across at screw ends = 2- 1/2"
Tallest back edge = 3/4"
OTHER MATCHING BOOT TIP ALSO SHOWN- SOLD SEPARATE.